For many years, Edmonton Events has successfully engaged CSTA’s Economic Impact Assessment team to measure the impact of events held in their community. 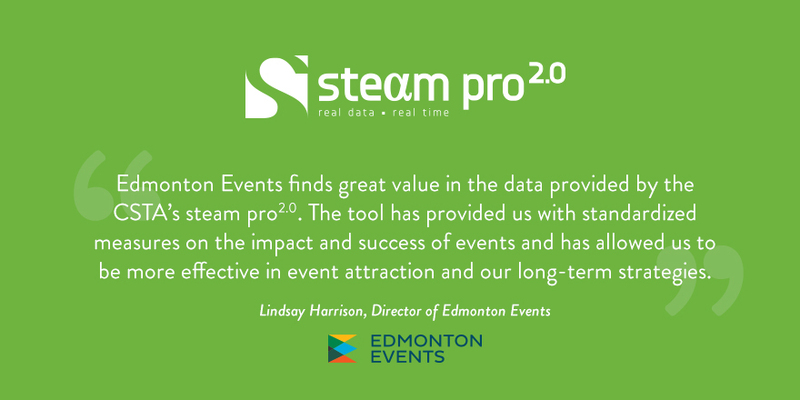 As Lindsay Harrison, Director of Edmonton Events indicates, CSTA’s steam pro2.0 tool provides standardized measurement, allowing them to compare apples to apples, and to be more effective in planning which events to bid on and host. It’s part of their long-term strategy to attract events to their destination. You can make it part of your overall strategy as well and demonstrate the value of your bidding/hosting program to stakeholders. Get a quote today and build assessment into your next event budget.